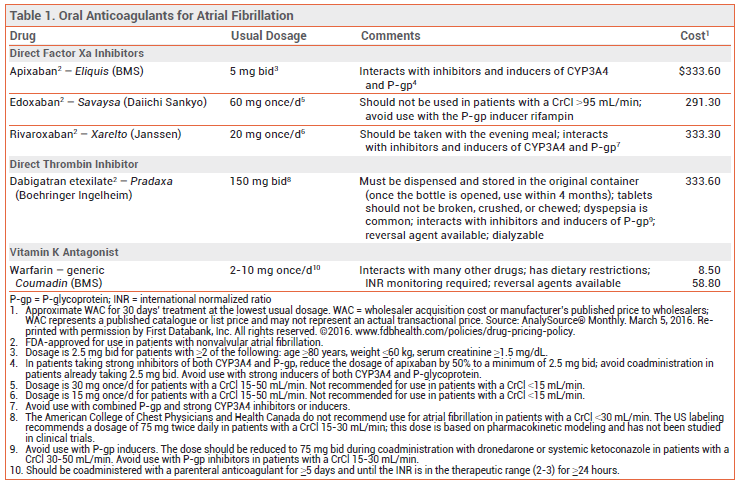 Which Oral Anticoagulant for Atrial Fibrillation? | The Medical Letter, Inc.
Direct-to-consumer advertisements continue to urge patients who take warfarin (Coumadin, and others) for atrial fibrillation to ask their doctors about the benefits of one or another of the newer oral anticoagulants. WARFARIN — In patients with nonvalvular atrial fibrillation, warfarin reduces the risk of thromboembolic stroke by about 60%.1 If necessary, vitamin K, prothrombin complex concentrate, or fresh frozen plasma can reverse its anticoagulant effect.2 Drawbacks of warfarin include unpredictability and variability in dosage requirements, dietary restrictions, interactions with many other drugs, and the need for close monitoring to keep the international normalized ratio (INR) in the therapeutic range (2-3). DIRECT ORAL ANTICOAGULANTS — The direct thrombin inhibitor dabigatran etexilate (Pradaxa) and the direct factor Xa inhibitors apixaban (Eliquis), edoxaban (Savaysa), and rivaroxaban (Xarelto) do not require routine monitoring of coagulation times and they have fewer drug interactions than warfarin. Drawbacks of the direct oral anticoagulants include absence of any method for monitoring the extent of their anticoagulant effect, short half-lives that increase the risk of thrombosis with missed doses, lack of data on their use in patients with end-stage renal disease, and higher drug costs. Bleeding – All of the direct oral anticoagulants had significantly lower rates of intracranial bleeding and hemorrhagic stroke than warfarin in the pivotal clinical trials. Compared to warfarin, the rates of major bleeding with dabigatran and rivaroxaban were similar and the rates with apixaban and edoxaban were significantly lower. CONCLUSION — The direct oral anticoagulants dabigatran (Pradaxa), apixaban (Eliquis), edoxaban (Savaysa), and rivaroxaban (Xarelto) have been at least as effective as warfarin (Coumadin, and others) in preventing stroke or systemic embolism in patients with nonvalvular atrial fibrillation, and they appear to be safer. Patients well controlled on warfarin (INR stable in the therapeutic range) could stay on it. For all others, one of the direct oral anticoagulants might be a better choice. Head-to-head comparisons of the new drugs are lacking. RG Hart et al. Meta-analysis: antithrombotic therapy to prevent stroke in patients who have nonvalvular atrial fibrillation. Ann Int Med 2007; 146:857. Kcentra: a 4-factor prothrombin complex concentrate for reversal of warfarin anticoagulation. Med Lett Drugs Ther 2013; 55:53. SJ Connolly et al. Dabigatran versus warfarin in patients with atrial fibrillation. N Engl J Med 2009; 361:1139. MR Patel et al. Rivaroxaban versus warfarin in nonvalvular atrial fibrillation. N Engl J Med 2011; 365:883. CB Granger et al. Apixaban versus warfarin in patients with atrial fibrillation. N Engl J Med 2011; 365:981. FDA draft briefing document for the Cardiovascular and Renal Drugs Advisory Committee. NDA 206316. October 30, 2014. Available at www.fda.gov. Accessed March 31, 2016. JS Kalus. Pharmacologic interventions for reversing the effects of oral anticoagulants. Am J Health Syst Pharm 2013; 70 (Suppl 1):S12.